Not only to safeguard yourself from the many website selling scams out there, but to make sure you make a good and solid investment. 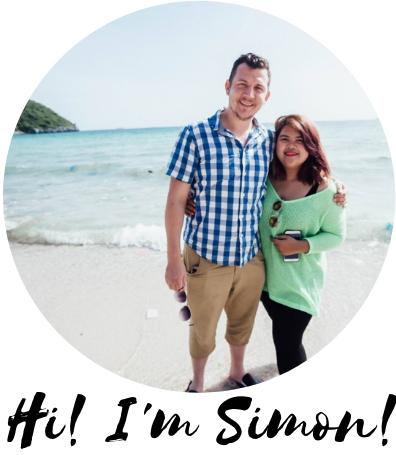 I’m Simon and today my affiliate website porfolio makes me over $6,000 a month (and growing). When I started out I couldn’t afford to outsource anything – I did all the website building, content creation, social media promoting, design etc. myself. You name it, if it had to be done, I was the only one who was going to get it done. This is how most of us start out I think, but as most regular Make Money Online Blog readers know – I’m a huge advocate for re-investing the money your affiliate websites make back into your businesses. Today I use sites like iWriter.com, Fiverr.com and HumanProofDesigns.com to outsource website building, logo designs, keyword research and writing and I recommend you do the same as soon as you can. I always say outsource as soon as you can! Because it’s the fastest way to give you time to concentrate on scaling and growing your online business. In his book Rich Dad, Poor Dad, Robert Kiyosaki talks about how the rich are rich because they know how to leverage their time and money so it works for them. I read it when I was 18 and since then I’ve learned how to make time and money work for me. I honestly believe buying a micro niche site is one of the best ways to do this. [alert-note]Niche site: A website with unique, quality content usually focused on a highly specific subject that makes money while answering the search engine visitor’s query. If you’re reading this, I’m going to assume you agree with me. The very fact you’re looking to buy a ready-made turnkey website shows you’re at the stage now where you can start outsourcing to take your online businesses and earnings to the next level. But buying a done-for-you Amazon affiliate website is a big step and there are things you need to look out for if you’re to safeguard your investment and see a return. [cookie cutter image]A cookie cutter site is a website you buy along with dozens of other people. You’ve got be really careful with sites like Flippa.com where you’ll lots of people making big promises but with nothing to back them up. It’s hard to find good website sellers out there who don’t try to rip you off by making as much money as they can selling the same website to as many people as possible, changing nothing but the domain name and logo. Sites with duplicate content will never get ranked in Google so you can wave goodbye to any potential of free website traffic coming your way. Most website seller set the the starting price based not on what the website is worth now, but on what they think it’s be worth say in 1 or 2 years time. The fact is the only reason you’re looking to buy a micro niche website is because you’re investing into an online business. This is why you need to make sure you know exactly how much your website can earn for you and what you need to do to make that happen. Buying a website is just the beginning of the process. It’s important to look at what level of support you’re the website owner. Will the person or company you’re buying the website from give you an action plan to maximise your affiliate commissions or just leave you high and dry after the sale has gone through? The truth is, most website sellers don’t even offer any support whatsoever. In their eyes you buy the website ‘as seen’ and that’s the end of it. Ideally, you should look for a micro niche site that comes with an earnings caluclator, a keyword strategy and plan of action so you get the most out of your investment. Be careful when buying pre-built or custom-built websites that are not built on well-known website building platforms like WordPress. Because if something needs to be changed or fixed down the line you’ll save yourself a headache (and a fortune) if you can’t do it yourself or get someone else to do it easily. Never buy a website with Private Label RIghts (PLR) content. This could be articles or posts that you can buy cheaply or are available for free. is filled out with only high quality, unique sales copy in order to maximise the user experience of your website visitors and maximise conversions. It might be worth checking a sample of posts for duplicate content, Copyscape.com can be your best friend here. Ideally you want a website that’s built using premum (paid-for) themes and plug ins that make your website look professional, give you quick page loading times and make your site search engine friendly. In my opinion, Human Proof Designs is the best place to find micro niche for sale and for several reasons. Feel free to check out my Human Proof Designs review for the full low down. Dominic Wells founded Human Proof Designs in 2013 after seeing that 99% of websites for sale are rubbish, are full of duplicate content that will never see the light of day in terms of search and don’t live up the outlandish earnings they promise you. Since launching Human Proof Designs Dom wells has become an expert at building teams and outsourcing and is constantly refining and streamlining the website building process. In 2016 alone Dom and his team sold over 500 high quality niche sites that are earning their owners an online income stream month on month. Feel free to check out customer’s testimonials here. Pre-built websites are made available every 2 weeks and cover a wide range of affiliate niches. A majority of sites build by the Human Proof Design team are done-for-you Amazon affiliate websites. Or if you’ve already got a niche website idea and just want to someone to built it, you can submit a custom-niche request. Buying a done-for-you affiliate site can be a great way to launch your affiliate marketing career, give you a headstart and save you months of building a website from scratch. It can also help you avoid the many mistakes newbies make and fast track your affiliate commission earnings. And if you’re a more experience affiliate marketer looking to expand your affiliate website portfolio, investing money into an income-generating asset like a niche site can be a smart strategic move. 1. What are the different types of niche sites? Each niche has been meticulously researched to beforehand so that you know your website is based in an untapped niche market to ensure it’s popularity and profitability. Each site comes with a breakdown of estimated earnings, a keyword pack and hours of video training to ensure you get the most out of your investment. If you already have a specific niche in mind you’d like to exploit, you can request a custom-made niche site that’s already optimised for search engines and ready to earn an income from. This can be a huge timesaver and cut out the long learning curve most beginners to affiliate marketing have to go through. An aged site is a website that’s been indexed in Google for 6 months or more. As all experienced affiliate marketers know, Google doesn’t start to rank a new website seriously until the 6 month mark. The beauty of buying an aged site is that you can view existing Google rankings and sales history because they’re already built they can be transferred over to you very quickly. 2. What are the pricing options? Aged websites are $1,497 just because they speed up the time it takes you to start earning by 6 months. For Human Proof Design’s ready-made and custom-made sites you have two price points to choose from – The starter level is $998 and Premium is just $1299. 3. How long will it take before I start making money from these sites? Although each site is already indexed and gaining rankings in Google, you get hundreds of video lessons and setp-by-step tutorials so you can continue to add content to your site and grow it to where it could be. Many Human Proof Designs customer starting earning within a couple of months. You can check out real customer testimonals here. 4. Can I see some micro niche website examples? Sure! The easiest way to to check the done-for-you Amazon affiliate websites for sale here. For live example of successful websites already making money by the Human Proof Designs team check out electricscoots.com and shavingsmooth.com. 5. How much can I earn from each affiliate website I buy? Each pre-built website you buy from Human Proof Designs come with an earnings summary bases on the overall niche, keywords your website is already ranking, price point of the Amazon products the site is promoting and other key metrics. You can few the potential earnings information by clicking on any done-for-you website here. 6. How long does it take to get my website? As soon as you purchase a niche website, Dom and his team will immediately get to work to building it for you. Within 4 weeks the income-generating asset is signed over to you. Here’s when you trasnfer the website to your own hosting and add your own unique affiliate links to start getting paid. With aged sites the process is a lot quicker and is usually completed in a week. 7. How much content will the website have and if I want more can I outsource it to Human Proof Designs? Yes and I’ve taken advantage of Dom’s SEO article writing service myself for some of my existing websites. I tried to outsource my blog post writing to places like iWriter.com and Fiverr.com and even with the higest rated writers, I was left bitterly disappointed. But, as I say, with Human Proof Designs you can be confident that each and every post will be written and edited by experienced professionals. After purchasing your site you can order monthly content packages if you wish. You can get a discount by ordering monthly or bulk content packages and be sure you’re getting high quality sales copy at a reasonable price, delivered in a timely manner. So if you’re an aspiring entrepreneur looking to begin your affiliate marketing journey, I hope I’ve shown you buying a done-for-you website really can speed up the whole process. You can avoid the mistakes most newbies make and with the ready-made sites, you know you’re entering into a profitable niche you can actually make money in. If you’re already a more seasoned affiliate marketer with several income-generating webstes already, outsourcing the niche and keyword research, website building and content creation is a great way to free up your time, make your money work for you and build out your site portfolio. Click here to find out more and buy a micro niche site. Have your ever bought an affiliate niche website before? Do you have any questions about making money with micro niche sites? Be sure to comment below and I’ll be more than happy to help you out. I would like to ask if I buy a ready-made micro niche website, can I select the host I want? I also like to buy a niche site or hire writers so I can focus on generating more sales and moving my business forward. HPD sure seems a lot beginner-friendly and way more high value than Flippa. Yes! Once the site is yours the support team will talk to you about hosting options and it is entirely up to you. This article provided excellent information. Although I’m not yet in a position to start buying ready-made micro niche sites, I have decided I would want to do this in the future. In the article you indicated we should stay away from PLR sites and I definitely agree with that. My question is how can I identify a PLR site? What gives them away? Would I be able to see that it is a PLR site or is it just by running article through a plagiarism checker? I have book marked this article to refer to it later. PLR stands for Private Label Rights and it’s when you can buy the rights to re-publish content. The issue with these is that these are sold to 100s of people at a time so there’s no search engine value and no chance of ranking for any of your content. Maybe the only time to use this is as a free give away incentive to help build your email marketing list, otherwise I wouldn’t bother. Yes you should always do due diligence and make sure all content of a website is 100% original before ever handing any money over. The best plagerism checker I’ve found is completely free to use and can be found at NoPlag.com. I have looked at several different places to buy sites to add to the portfolio of ones I have built myself. I found a I was out of my depth with deciding if the price was right or not and if it was a bonafide site at all. You would think after building my own I would have some idea but I just kept going round in circles with making a decision. Your post has really helped me to think more clearly and will definitely be checking out Human Proof Designs. Thanks Karen, your comment made my day! You really can’t go wrong with a Human Proof Designs’ micro niche site. I know they have an early bird list too so you can get emails when the latest sites are released. Feel free to check out my Human Proof Designs review here if you haven’t yet and let me know if you have any questions. I am very familiar with Human Proof Design and its founder, Dom Wells. He’s really a good guy, and one of the persons I look up to. Being an online entrepreneur by heart, I sometimes think of buying a ready-made micro niche site from him one of these days. If the site I am about to buy is already making money in Amazon, who will convert the affiliate links throughout the site to my affiliate link? Me, or the seller? Hey Gomer, So with a done-for-you micro niche site that’s already making money with Amazon you’re going to be looking at the Aged Sites because these already have existing rankings and traffic. Once you’e bought the site, the after-sales support team guide you through organising your own web hosting, creating an Amazon affiliate account if you need to and so on and transfer all the links over to you. Hope this helps and yes, Dom is the real deal and even in the last 12 months I’ve seen him make Human Proof Designs better and better. I have bought article packs from him before and his work is definitely the best quality I’ve seen and the prices are very reasonable too. I have checked out niche sites that were for sale on Flippa. I wanted to buy one but I was not sure if it was a good decision. I think that I need to learn how to evaluate a website. How do you decide how much you should pay for a site? With Human Proof Designs it’s easy because you can either choose the Starter $998 option or the Premium $1299 option. When you browse the niche sites for sale take a look at the attached esimated earning potential for that site. This should give you an idea on how quickly you’ll get a return on your investment. I’ve seen sites on Flippa going for $3,000-$5,000 and when I looked they might have high traffic but low conversions. Low quality traffic is the same as no traffic – any niche marketer knows you need traffic thats highly targeted and ready to buy. Wherever you buy your site from, always do your research and decide what your goals are. Hi Roberto, honestly I think Human Proof Designs offer great value. In my Human Proof Designs review I point out that if you were to buy the premium themes, plug ins and content it would end up costing you a lot more and would take a lot more time to get to the same point. But I totally get that at $499, this might not be for everyone. It boils down to what you have more of: time or money. If you have more money, buying a micro niche site is definitely the smart way to go, if you have more time then I guess you can build your own site from scratch, but be aware that this process will take a lot longer. I’m a huge advocate for outsourcing as soon as possible, so I always recommend re-investing the profits you make from your niche site back into outsourcing content ro expanding your portfolio to include new niches.